French Emblems: Emblem: Locuples satellitium divitum. Wealth attracts wealth [lit. the rich entourage of rich men]. Arquato, ac praefert agmine mille pedes. Gressus; assequitur longa caterva comes. Bristling with hairs, the Caterpillar crawls along with an arching movement, and it goes marching at the head of a column of a thousand feet, too. Eminent men go strutting about, and gather proud crowds about themselves; a long troop of followers accompany them. tus aliquis multo comitatu superbus possit. Dio, nicknamed ‘of the golden mouth’, that most celebrated philosopher and orator among the Greeks, provided the inspiration for this Emblem in his On Diogenes, or, Concerning Slavery, where he likens wealthy men, surrounded by a bothersome entourage of lackeys, to caterpillars (in French, chenilles, if I’m not mistaken; the Latin language calls these hairy worms that move in an arching motion ‘millipedes’ or ‘multipedas’ [see footenote 1 below]). For they move as if with a numberless army of feet, and yet they are the slowest of creeping things - this is the translation meaning of his words esti to pragma omoion tois ioulois, oi murious podas echontes, bradutatoi eisi tôn erpetôn. With a similar thought in mind, he calls the triremes of Paris, in which he went looking for Helen, ioulopezous, moving like a caterpillar, on account of their numerous ranks of oars. 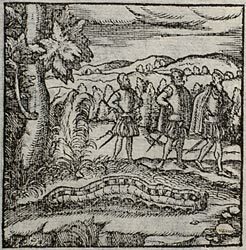 Our present-day Torquatus Crassuses [or ‘be-necklaced Crassuses’, see footnote 3 below], with their great entourage of slaves, and our noblemen with the ruinous greed of a Tantalus,* be most aptly compared to these caterpillars: those men who congest the public squares, with their arms and armaments akimbo [see footnote 2 below], hairy with their animal-skin cloaks and the hides of wild beasts, and mincing proudly along, and carry along behind and beside them a great crowd of hangers-on, both lackeys and slaves. The appearance of the caterpillar is well-known, and as a result the conception of the picture is straightforward, except that one of these proud men could be put in to beautify it, in an upper corner of the image, adorned with a chain round his neck and a great entourage. * Or ‘our noble Tantaluses with their ruinous greed [or hunger]’: the reference could be to the greed that brought Tantalus’ downfall, or to the insatiable hunger that tormented him in Hades - the former being more appropriate here, though it is for the latter that he is better remembered. 1. Iulus is a Greek word originally meaning ‘down’ or ‘fuzz’, used in Latin for the downy part of plants, e.g. a catkin. Dio used the word in Greek to mean a caterpillar, though it seems not to have been used in Latin for this - hence Junius’ explanatory parenthesis in the prose. Millepeda is used of a hairy caterpillar by Pliny (Natural History, 29.6.39.136). 2. Ansatus means ‘with handles’ and thus, ‘with arms akimbo’, or perhaps ‘with their swords or clothes sticking out’, and generally taking up a lot of space (again, see the prose, and also the engraving - this suggests that Junius had in mind men who strut around with their puffed-out breeches and swords sticking out.). 4. Classical references inlcude no ‘Crassus Torquatus’: this is probably a fabricated name reflecting the symbols of power and wealth in Rome: the military hero Manlius Torquatus (who conquered a giant Gaul and wore his necklace), and the richest man in Rome, Licinius Crassus. Alternatively, if ‘torquatus’ were not capitalised, it could mean (as later in the paragraph) ‘with decorative or honorific chains round their necks’. 5. incessus fractus: Quintilian, Institutio oratoria, 5.9.